The Preces and Responses are by Bernard Rose, who for many years was Informator choristarum at Magdalen College, Oxford. In addition to his influential work as a choir trainer, he was a scholar and editor of Tudor church music. 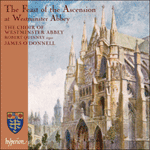 His tuneful and attractive responses are a mainstay of the Anglican choral repertory. The treble line of the choral response ‘And make thy chosen people joyful’ quotes the chimes of the Magdalen College clock. Les Preces et les Responses sont de Bernard Rose, qui fut durant de nombreuses années Informator choristarum à Magdalen College (Oxford)—une charge de formateur choral qui lui valait une certaine influence et venait s’ajouter à son double statut de spécialiste et d’éditeur de la musique liturgique Tudor. Ses mélodieux et séduisants responses sont l’une des bases du répertoire choral anglican. La ligne de treble du response choral «And make thy chosen people joyful» reprend les carillons de l’horloge de Magdalen College. Die Preces und Responses sind von Bernard Rose, der viele Jahre lang Informator choristarum am Magdalen College, Oxford, war. Abgesehen von seiner einflussreichen Arbeit als Chorausbilder war er als Forscher und Herausgeber von Kirchenmusik der Tudorzeit tätig. Seine melodiösen und attraktiven Responsorien sind ein fundamental im anglikanischen Chorrepertoire. Die Oberstimme des Chorresponsoriums „And make thy chosen people joyful“ zitiert das Geläute der Uhr des Magdalen College. Grant, we beseech thee, Almighty God, that like as we do believe thy only-begotten Son our Lord Jesus Christ to have ascended into the heavens; so we may also in heart and mind thither ascend, and with him continually dwell, who liveth and reigneth with thee and the Holy Ghost, one God, world without end.